BIOS stands for Basic Input Output System. It is contained on every computer system and makes sure every component like CPU, Hard drives, Ports work together in proper order. BIOS software contains information to start and function a computer. 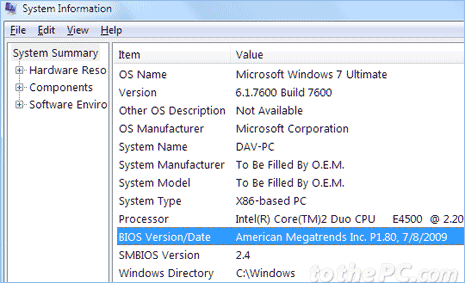 BIOS software can be updated after sometime and you need to know the current version and date of BIOS on the computer for updating process. 1. On Windows, goto Start > Run to open ‘Run’ dialog box. 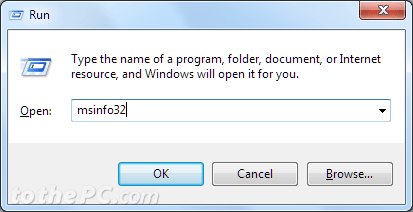 Windows 7 users can click Start Orb button and type run on search bar to open ‘Run’ dialog box. 2. Type msinfo32 in the Run box and click OK to open ‘System Information’ window. 3. Check in the right column of ‘System Information’ window for BIOS version / date. This window also display other core system details like: SMBIOS version, processor, system type, system model and so on. There is even easier method to check BIOS information without performing above steps. 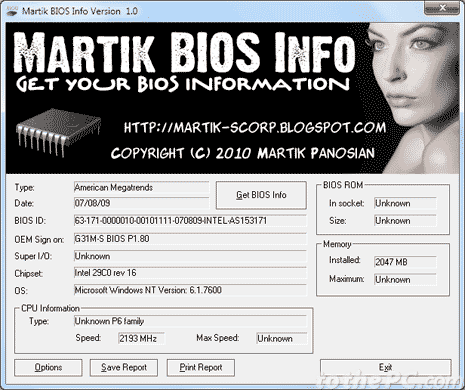 You can download free portable utility ‘Martik BIOS INFO’ to get BIOS version type details. This utility does not require any installation. 1. Download Martik BIOS INFO utility file from this website (brothersoft.com/martik-bios-info-400509.html). Downloaded file is in RAR format, you can unzip and extract contents using winrar or use 7-zip program (www.7-zip.org). 2. Once Martik BIOS INFO window opens, click ‘Get BIOS Info’ button. If you get login as administrator error, then right click on Martik BIOS INFO exe file and click ‘run as administrator’ option to launch the program. The utility window will show all BIOS related details including: version type, date, BIOS ID, OEM sign, chipset, OS information.